Shona ran through the glen, her red hair bouncing up and down on her neck. A red ribbon was tied to her braid and it matched her tartan skirt. Her white blouse had tiny red hearts at the neck. She was a bonnie lass. Her mum and dad waved goodbye as she leapt over a bright yellow daffodil. "I wonder if I’ll see any rabbits today, or maybe a baby fox, or a raccoon," she smiled. She loved the animals that lived in the glen and they loved her too. HOP! HOP! HOP! A rabbit ran across the path in front of Shona. "Och, a wee rabbit. Where are you heading?" She followed it as it scampered through the wildflowers. "Come back here and let me pet you," she called, but the rabbit didn’t stop running. Shona soon tired of chasing it and sat down on an old tree stump to rest. She heard a soft whimpering sound coming from behind a thicket of wild hawthorns and raspberry bushes. "What’s that?" she wondered. She stood up and tiptoed quietly towards the sound. The noise got a bit louder. "It sounds like a wee bairn crying," she said, confused. "What would a bairn be doing out here, in the middle of the glen?" She soon to a clearing and gasped, staring in surprise. "Och, what’s this?" The ground was covered with small mushrooms and behind them was a tulip patch. 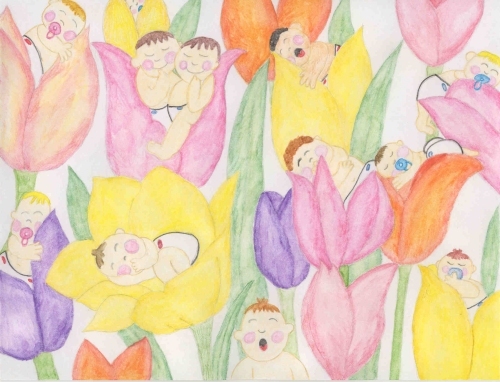 The flowers weren’t like ordinary tulips, they were huge, bigger than Shona was and in the middle of the colorful petals, lay a sleeping baby. "What’s all this? A flower patch full of bairns?" She crept up and pulled back the petals of a bright yellow tulip. "Och, it’s a wee laddie. He’s adorable," she smiled. The baby lay wrapped up in the soft petals, sleeping soundly. She looked in a bright red flower. There was another baby. "It’s a wee lass. Look at her tiny toes," Shona giggled. Every flower, whether purple, pink, orange, red, or yellow, held a wee baby. Shona didn’t know what to do. "Where did all these bairns come from?" Just then she saw something even more amazing. A small fairy, dressed in pale green, came floating down from the branch of a tree. "You’ve found the babies," she said, looking inside a pink tulip. "Who are you?" Shona asked. "My name’s Columbine. I’m a fairy and it’s my job to take care of these babies until its time for them to go to a new home. They’re bonny, aren’t they?" the fairy said. "Och, they’re lovely. What are their names?" Shona asked. The fairy took her from flower to flower. This wee lad’s name is Buttercup. This is Water, Feather, Yarrow, Juniper, Rainbow, Icefly, Gossamer, and the twins are Willow and Bracken." "What beautiful names. I wish I had a name like that," Shona said. "What is your name?" the fairy asked. "Your fairy name is Bramble," Columbine told her. "That’s pretty. I like it," Shona smiled. "How do you feed the babies?" she asked. "They sip the nectar from the tulips. Butterflies and dragonflies come at night with milk from the cows in the nearby farms. You’re very curious, Bramble," the fairy said. "I know. My mum always tells me that. How did the tulips get so big?" she asked. "This is the Fairy Woods. Everything’s different here. See the mushrooms over there," Columbine pointed. "They are magic. If you eat one, you’ll be able to fly." "Och, can I try one?" Shona begged. "Just take a little nibble. Don’t eat the whole mushroom," the fairy warned. Shona picked a mushroom. It was white on top and brown underneath. She took a little bite. "Can I fly now?" she asked. Shona jumped into the air and flew around the sleeping bairns. "I can fly," she said, excitedly. She swooped past the soft petals, letting them brush her face and around the trees and through the grass. She stopped at Columbine’s feet. "That was fun." "You can only do it once a day though," she cautioned. One of the babies began to stir. "You must leave now. The babies can’t be disturbed." Shona didn’t want to go. She wanted to stay in this magical place. "Can I come back?" she asked the fairy. "Tomorrow, if you can find us," Columbine said. "Goodbye, Bramble." Shona waved goodbye, walked through the mushrooms and out of the clearing into the thickets. She soon found herself in the wildflowers. She ran home as fast as she could and told her mum and dad. Her mum smiled and said, "How wonderful." Her father rubbed the top of her head. "Time for bed, Bramble," he said. Shona went upstairs and climbed into bed after a delicious supper. She dreamed about the bairns sleeping in the tulips and about Columbine, the fairy. The next morning, after breakfast, Shona ran back into the glen and searched for the thicket of wild hawthorn and raspberries, but never again did she find the Fairy Woods, Columbine, or the bairns in the tulips. Each time she saw a dragonfly or a butterfly, she remembered that day in the glen, where she was allowed to share in a bit of magic with the fairies.